25 years ago, SAP introduced SAP R/3 to the market. A few years later, the SAP Certification program was launched, which allows SAP experts and professionals to prove their SAP knowledge. Since the beginning, the SAP certification program was based on computer-based exams with a strong focus on practical knowledge. Today, SAP offers more than 150 certification exams from the associate to the professional level – especially for our new cloud solutions like SAP Ariba, SAP SuccessFactors, and SAP S/4HANA. More than 40,000 SAP professionals are becoming certified every year. When SAP R/3 was introduced, you were only able to take the certification exam at SAP training locations after attending a 6 week consultant academy program. Subscribe to SAP Learning Hub to review available Learning Journeys and certifications. A Learning Journey features recommended training materials to prepare for a certification exam. Alternatively, you can display all exams here. SAP Learning Rooms are moderated learning communities on SAP Learning Hub. In SAP Learning Rooms, experienced trainers and moderators help you to prepare for your certification and answer your questions. In many SAP Learning Rooms additional webinars and info sessions for certification preparation are offered. Please note that most learning rooms are only available to learners with full SAP Learning Hub subscription. Study the recommended training materials on SAP Learning Hub to prepare for your SAP certification exam and keep track of your progress. For many topics you have the choice: You can either prepare yourself with interactive e-learning courses or read flipbooks (please note that most materials are only available to learners with full SAP Learning Hub subscription). In addition, you can practice your knowledge with cloud-based SAP Live Access training systems (option with additional costs). On SAP Learning Hub, you will find many assessments, quizzes and sample questions to check your knowledge. Ensure that you use those to check your readiness for certification. Collaboration and exchange with other learners and trainers help you to deepen your understanding. Finally, you can purchase your Certification in the Cloud subscription in our SAP Training Shop. One subscription is including 6 online exam attempts in a 12-month subscription period. You can take 6 different online exams or you can take one exam up to 3 times. Note: Not all exams are yet available as certification in the cloud. Check the availability here. You want to become a certified consultant for SAP SuccessFactors. You subscribe to SAP Learning Hub to start with your learning journey. 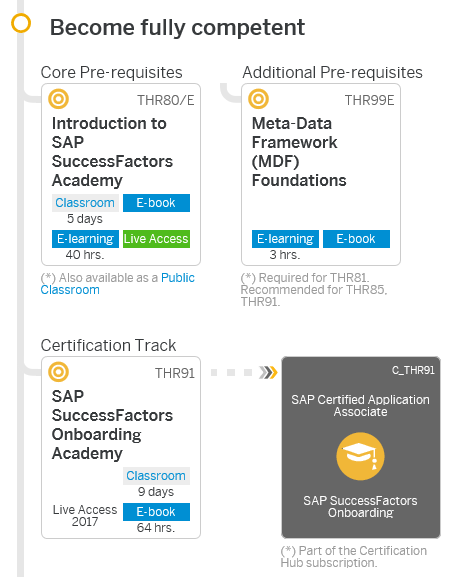 You join the Introduction to SAP SuccessFactors Learnig Room and study the recommended e-learning courses THR80, THR99 and THR91. You are also attending the additional webinars offered in the Learning Rooms and discuss open questions with other learners and the moderators in the forum of the SAP SuccessFactors Learning Room. Finally, you purchase your SAP Certification in the Cloud subscription and take the “SAP Certified Application Associate – SAP SuccessFactors Onboarding”. After some project experience, you can even upgrade your certificate to the professional level. You will use the rest of your contingent, while you continue on your SAP SuccessFactors learning journey, e.g. to become an expert in SAP SuccessFactors Learning. SAP Learning Rooms help you to keep your knowledge up-to-date with delta content and assessments. Thank you very much for publishing the LH article. Can we get all SAP HCM Applications Cloud Delta Upgrade quarterly exams in Full professional Edition Learning Hub after subscribing to SAP Learning Hub? Is this Only restricted to Partner or SAP consultants to take Delta quaterly exams with Partner’s / SAP S-User ID account ? Yes you can take the delta assessments for SAP SuccessFactors in the professional edition of SAP Learning Hub. The delta assessments are available in the corresponding Learning Rooms and allow you to keep your certification current. You take the core exam in the Certification Hub. I hope this helps and sorry for the huge delay! Thank you so much for your detailed message on how to get certified. I am interested in SAP ERP SD. Please what are the appropriate steps from SAP01 Overview through certification? And what learning room(s) should I join? Some links will be of a good help please. Particularly, rooms for hands-on-training, selfpaced. And do you recommend books from SAP Press? I used to go to a big city like Chicago for like 5 days to take one single SAP course… so with this great SAP Learning Hub, I just purchase a Hub subscription, and then take a self-paced course (with course content included in the subscription) , then add a “contingency” of a practice system for 20 hours…. with these 3 things, it completely replaces by 5-day education journey and travel costs???? Cost of Chicago education trip: 2,000 + 5,000 USD = 7,000 USD…. cost of the Hub course equivalent: = around $1,500…. this does not make sense to me?? ?